Ever since the Nintendo Switch released last March, people have been painting them, modding them, and 3D printing all manner of accessories for them. One of the latest is a Joy-Con grip that can fit your phone inside it. The creation belongs to Nathan Becker and comes by way of htxt. With slight alterations, the contraption can fit either an iPhone X or Samsung S8+, although it wouldn’t be too complicated to make it work for other form factors either. Measuring about 160 X 14.3 X 101 milimeters the grip took about 10 hours to print using .1mm layers. You can see the files for the prototype over at Thingverse. While you can use the grip as a way to play games on your phone with the Joy-Con, latency issues people have experienced connecting them over Bluetooh means it’s hardly ideal. Instead, the real utility is in having a slot for keeping your phone nearby when utilizing the Nintendo Switch online app, currently the only way to chat with people during multiplayer matches. It’s still a ridiculous amount of hassle, but being able to embed your mobile device direction into the grip rather than having it hanging off the top as in other setups has its advantages. 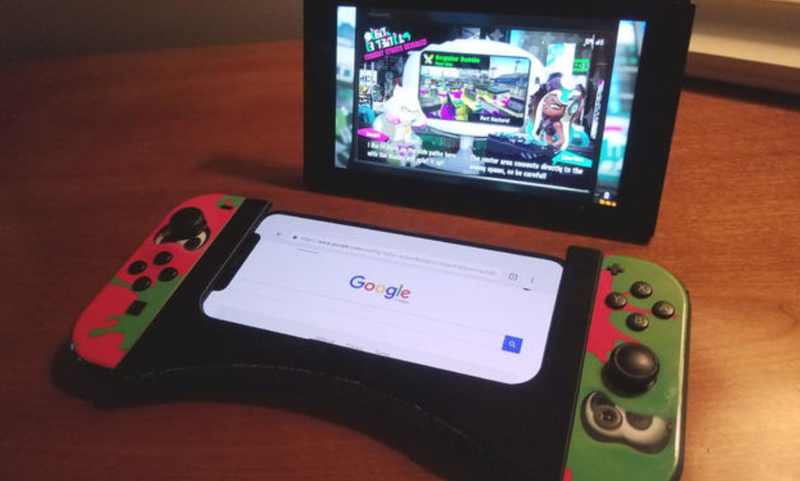 Or you could simply use the device as its creator did and check Twitter or stream movies while a game’s loading or you’re waiting for your next Splatoon 2 match to queue. You can see more pictures of the the 3D printed accessory over at htxt.